In a 2019 publication, in Physical Review Letters, researchers have achieved the highest energy yet recorded using what they call a “plasma wakefield accelerator.”  We know today particle accelerators can speed up subatomic particles almost to the speed of light and then smash them together. The resulting data is used to understand the creation and destruction of new elements to gain a greater understanding of the fundamental particles and forces that make up our universe. Particle accelerators typically are very expensive and are enormous in size where the particles are accelerated in a circular pathway in order to reach these high speeds. This new technology has the capability to significantly decrease the size of an accelerator to the size of a tabletop being capable of accelerating particles over a distance of mere centimeters. A. J. Golsalves et al., “Petawatt laser guiding and electron beam acceleration to 8 GeV in a laser-heated capillary discharge waveguide,” Phys. Rev. Let 122, 084801 (2019). E. Adli et al. (AWAKE Collaboration), “Acceleration of electrons in the plasma wakefield of a proton bunch,” Nature 561, 363 (2018). M. Turner et al. (AWAKE Collaboration), “Experimental observation of plasma wakefield growth driven by the seeded self-modulation of a proton bunch,” Phys. Rev. Lett. 122, 054801 (2019). E. Adli et al. (AWAKE Collaboration), “Experimental observation of proton bunch modulation in a plasma at varying plasma densities,” Phys. Rev. Lett. 122, 054802 (2019). There are two methods for creating a wakefield acceleration, (i) using laser-driven wakefields which generate 8-GeV (giga-electron volts), a new energy record that doubles the previous record  and (ii) using proton beams as drivers, which generates 2-GeV. [3-5] These recent publications highlight the key achievements in the development of this technology. Particle accelerators use electric fields inside of metal cavities to speed up electrons. The Large Hedron Collider at CERN in Switzerland is the largest accelerator ever built that is functioning and is a 16-mile ring of superconducting magnets that can accelerate electrons near the speed of light. In contrast, the plasma wakefield acceleration involves firing a very intense and short burst of light into a cloud of ionized gas (plasma). The laser causes a wave to form in the plasma field and leaves a wake of charged particles behind it. A similar analogy would be compared to a boat going through the water it leaves a wake, the laser in a plasma field also leaves a wake. Then researchers fire a second laser pulse which puts more electrons into the plasma. When the timing is right, the electrons surf the wakefield. In this method of acceleration, the electrons draw energy from the wakefield to pick up more speed just like a surfer does on the side of a wave. The practical applications to this applied science and technology may be in medical therapies, x-ray imaging, and security scanners. The end goal is to generate a stable plasma accelerator with energies near 10-GeV. In order to achieve 10-GeV researchers need to have greater beam stability, beam control, and compact electron sources that affect the final energy and energy spread of the accelerated particles. So What is the Spiritual Insight? In the Jewish teachings on the Shabbat and from the Torah, we read how the people in the wilderness were learning to apply God’s Word to their lives. The rabbinic interpretations on the shabbat speak of the differences between intentional and unintentional sin, and of spiritual (heavenly) work and physical (earthly) work where the sabbath rest applies to both the spiritual and physical work that we do. The commentary Or HaChaim on Shemot / Exodus 35:2 speaks of the creation being completed following an entire week including the Sabbath rest. The Sabbath rest is a fundamental part of creation and because of this should also be a fundamental part of our lives as well. The Shabbat was the reason why the eighth day is chosen for circumcision of a new born male and why a newborn calf was not qualified for sacrifice until following eight days which included a sabbath day of rest. There is also a lesson here that the success of the work performed during the six days of the week depends on the observance of the seventh day as a holy day. The reason is that the Sabbath is the soul of the world as we explained in our introduction to Genesis on Genesis 2,2. We find a similar idea in the Zohar-Tazria (page 13 Sullam edition) as to why the rite of circumcision cannot be performed before the eighth day, and why an animal is not fit to serve as a sacrifice until the eighth day of its life. In either case one has to wait until at least one Sabbath has passed so that each has attained a נפש, a soul full of vitality. Our verse then describes G’d as putting the finishing touch to His creation by bringing on the Sabbath, not by creating on the Sabbath. The reason the Torah repeats once more מכל מלאכתו אשר עשה, from all His work which He had done, is to emphasize that this work had been done previously, i.e. before the onset of the Sabbath. The word ויכל therefore refers to activity carried out previously. All that had been lacking was something that would give permanence to this universe of ours. The seventh day, i.e. the Sabbath, completed the cycle that provides this permanence. We are therefore entitled to view the Sabbath as one of the seven days of creation. The proof that we are correct may be the very fact that we do not find the usual: “it was evening it was morning the seventh day,” meaning there was no בריאה on that day. יב והנה נתבאר היטב דבר התיקון של הרצון לקבל, המוטבע בנשמות מצד מחשבת הבריאה. כי הכין הבורא ית’ בשבילן ב’ מערכות הנ”ל זה לעומת זה, שעל ידיהן עוברות הנשמות ומתחלקות לב’ בחינות: גוף ונפש, המתלבשים זה בזה. וע”י תורה ומצות, נמצאים בסופם, שיהפכו צורת הרצון לקבל כמו צורת הרצון להשפיע. ואז יכולים לקבל כל הטוב שבמחשבת הבריאה. ויחד עם זה זוכים לדבקות חזקה בו ית’, מפאת שזכו ע”י העבודה בתורה ומצות, להשואת הצורה ליוצרם, שזה נבחן לגמר התיקון. ואז, כיון שלא יהיה עוד שום צורך לס”א הטמאה, היא תתבער מן הארץ “ויבולע המות לנצח”. וכל העבודה בתורה ומצות, שניתנה לכלל העולם במשך “שתא אלפי שני דהוי עלמא” (6000 שנה), וכן לכל פרט במשך שבעים שנות חייו, אינה אלא להביאם לגמר התיקון של השואת הצורה האמורה. גם נתבאר היטב, ענין התהוות ויציאת מערכת הקליפות והטומאה מקדושתו ית’, שהיה מוכרח זה, כדי להמשיך על ידה בריאת הגופים, שאח”כ יתקנו אותו ע”י תורה ומצות, ואם לא היו נמשכים לנו הגופים ברצון לקבל שבהם המקולקל ע”י מערכת הטומאה, אז לא היה אפשר לנו לתקנו לעולם כי אין אדם מתקן מה שאין בו. It is now well understood that the desire to receive must undergo a transformation (tikun) and become a desire to give. Both the desire to receive and the change needed, were in God’s thought when he created the world. For the Creator created two systems, “this one as well as that one”, and the Soul goes through both systems, and is endowed with a [spiritual] body and a soul. And through Torah and Mitzvoth the person transforms his desire to receive into a desire to give, and becomes a “receiver in order to give”. That person can now receive all the goodness from God, and at the same time have a strong connection with Him, because through Torah and Mitzvoth he has acquired “similarity of form” to his Creator. This stage is called “the last state of tikun”, or ” the thought of creation”. Now there is no longer a need for the impure “other side”. When this occurs, “death will be no more”. Being diligent in Torah and Mitzvoth during these “6000 years” and in a person’s lifetime, is for them to attain this final stage. It is now understood that evil, the “shells” and impurity, which have their roots in the body (the desire to receive), had to be created, in order to transform the desire to receive, into a desire to give, for one cannot change what they don’t possess. So what is being said is that the desire to give is something that we do not possess. The idea here being put forward is both the desire to receive and the desire to give were created in the beginning. What was created first was the desire to receive (this is pictured in the creation week, God giving to His creation life), and this needed to be changed into the desire to give illustrated by our giving back to God in the sabbath rest. The Rabbis say this is accomplished in the Shabbat, as giving back to God by resting and drawing near to him. The commentary states that it is through the Torah and the Mitzvot that a person transforms his desire to receive into a desire to give. Note how this is consistent with a previous article in which we discussed forming good habits which lead to neuropathway formation and overcoming sin. The performance of the mitzvot (commandments) functions in this way to do what is righteous, holy, and good, leads to more of these same things in our lives. If we consider the scientific research on electron acceleration and wakefields, we find these same concepts of receiving and giving. 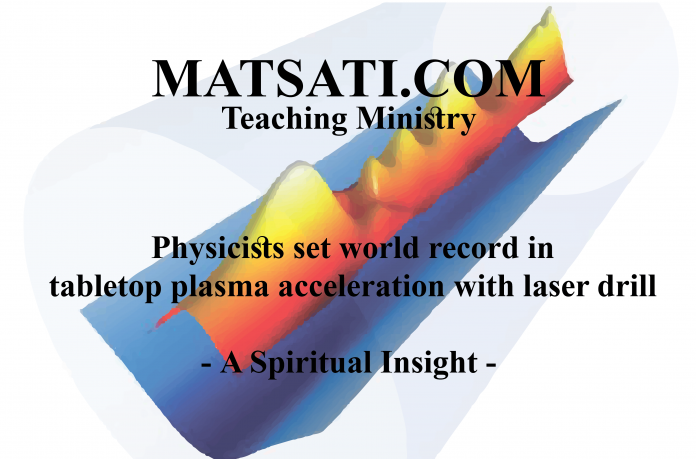 The laser strikes the plasma field creating a wakefield which is received from the laser, this wakefield then gives to the electrons an acceleration of energy to increase its potential. The good things that we receive from God are not meant just for us, but also for us to share with others. This illustrates the basic function of receiving and then giving, this is how God created us to live. This is paralleled to the Lord God Almighty as the creator, and to us who live our lives according to His Word, when we do so we are acquiring His form in similarity to the Creator, we are being made after His image. (Colossians 3:10) This is evident in our lives as having Mercy, Grace, Love, Patience, Long Suffering, Slow to Anger, and Generous towards others. Note how this is the greater insight that we receive from the scientific research, in taking God’s Word, applying it to our lives as having far reaching influence upon our friends, our family, and even the world. The commentary concludes saying “It is now understood that evil, the “shells” and impurity, which have their roots in the body (the desire to receive), had to be created, in order to transform the desire to receive, into a desire to give, for one cannot change what they don’t possess.” This is an important point, all good things are given from God, (James 1:17) and including the transforming power of God in our lives to give as opposed to receive. Notice how the rabbis are drawing out this concept of the Lord creating us in such a way so as to have an active roll in our lives to transform us from the inside out for His glory! Take for example in the life of the Apostle Paul. We learn about Paul in the book of Acts where he was persecuting the early believers, imprisoning, and even putting to death the followers of Yeshua. Paul wrote to Timothy saying, 1 Timothy 1:12 I thank Christ Jesus our Lord, who has strengthened me, because He considered me faithful, putting me into service, 1:13 even though I was formerly a blasphemer and a persecutor and a violent aggressor. Yet I was shown mercy because I acted ignorantly in unbelief; 1:14 and the grace of our Lord was more than abundant, with the faith and love which are found in Christ Jesus. 1:15 It is a trustworthy statement, deserving full acceptance, that Christ Jesus came into the world to save sinners, among whom I am foremost of all. 1:16 Yet for this reason I found mercy, so that in me as the foremost, Jesus Christ might demonstrate His perfect patience as an example for those who would believe in Him for eternal life. 1:17 Now to the King eternal, immortal, invisible, the only God, be honor and glory forever and ever. Amen. (NASB) Here Paul stands upon the resurrected one, the one whom the Lord God Almighty had sent to save us from our sins! Without God’s help, it would be impossible to have Mercy, Grace, Love, Patience, Long Suffering, Slow to Anger, and being Generous towards others. This was the purpose God had from the beginning, to transform us, this is what is being illustrated in the plasma wakefield research, and this is also illustrated by the Sabbath rest, to live our lives for His glory! We receive strength in God’s Messiah, His help, and His Holy Spirit to help us to overcome sin. Next articleWHAT IS A SPIRITUAL INSIGHT?